Getting Off The Magic Roundabout. Wellington, North Island, NZ. 16th March 2015. Fokke Triplane, as used by Baron Von Richtoven. On the way to Picton to catch the ferry I stopped off at the Aviation Heritage Centre, near Blenheim. 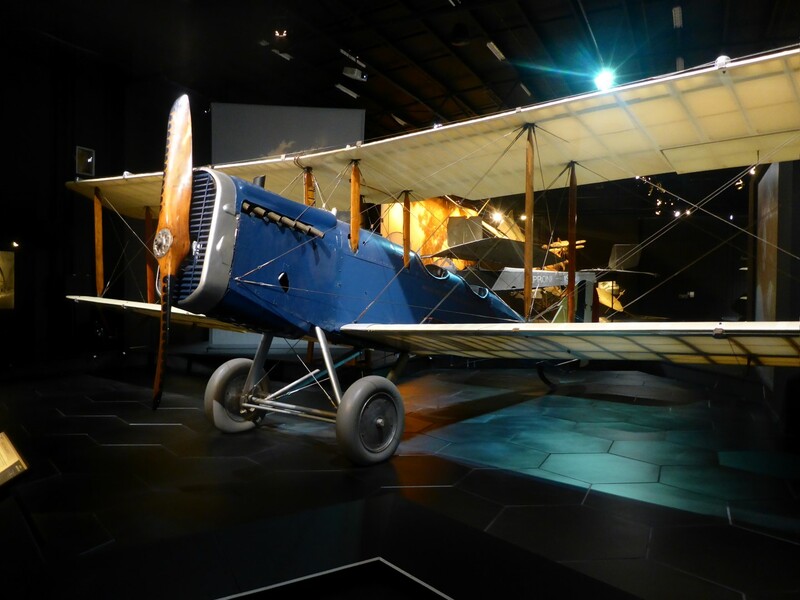 Set up by film director Peter Jackson, it features sixteen different displays of WW1 planes and artefacts, some from his own collection. Many of the planes are real, others are copies or models. Some of them were displayed in realistic situations, such as being crashed into a tree. 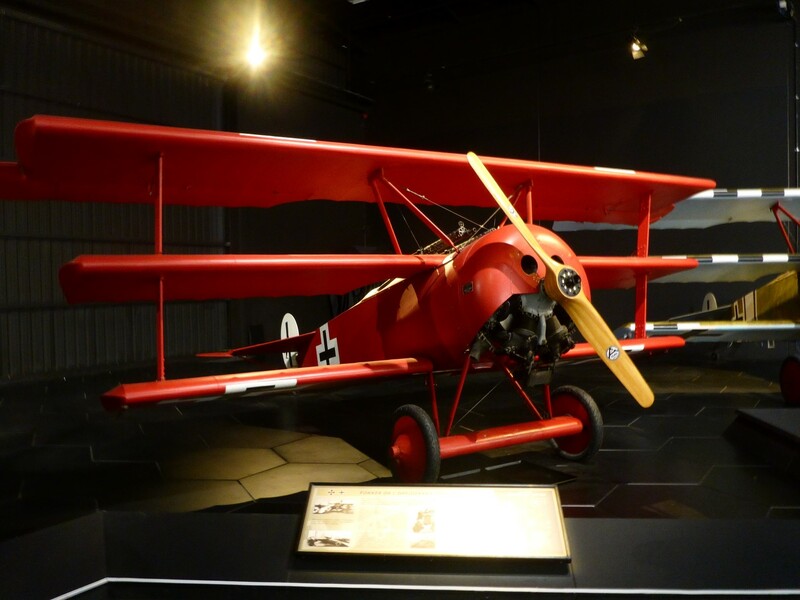 The shooting down of the Red Baron was one example. It was interesting to note that there were as many German planes and artefacts as Allied ones. No jingoism here. My only criticism was that the atmospheric lighting was far too dim for decent photography. Really annoying. Once on the ferry, I was strapping my bike down when the sidestand snapped in two. I’d noticed a small crack in it earlier but was hoping it would last until I could get it welded. The extra strain of being ratcheted down was too much for it and next thing I knew, my bike was laying against the one next to it. Fortunately the rider was a friendly and helpful guy and between us we picked it up and got it strapped down securely. He also helped me get it unstrapped once we got to Wellington too. I can safely say I was very grateful! On the boat was a party of Germans enjoying an organised tour, confirming what a popular destination NZ is for adventurous European bikers. A fairly common country scene. I went back to the same hostel as I’d used last time I was in Wellington. Apart from anything else, I knew I would be able to lean the bike against the wall outside quite easily! Next morning I headed up to Red Baron Suzuki where I collected the replacement for the screw-in cap they’d damaged and talked to them about welding my stand for me. They said they couldn’t do it but gave me directions to a place nearby which they used. Stewart, the owner, came down at that point and said he’d lead me there as he was going past anyway. He came in with me but the welder wasn’t there so I left the stand with them and went back to the hostel. When I came back out to return to the welder’s I found a parking ticket on the bike, for leaving it on the pavement. Damn! It was only for $40 (£20) so I swallowed hard and paid up later on. The hostel was opposite the town hall, where the parking ticket office was located, so it seemed the sensible thing to do. The welder, Chris, had done a superb job and wouldn’t take any payment. He asked instead if I’d give some sponsorship money towards an event his young daughter was running in. I offered $20 but he insisted on only $10 and asked that I put my address on the form as London, UK. It would delight his daughter, he said, and I was happy to oblige. Kiwi generosity in action once more. Stewart, owner of Red baron Suzuki. 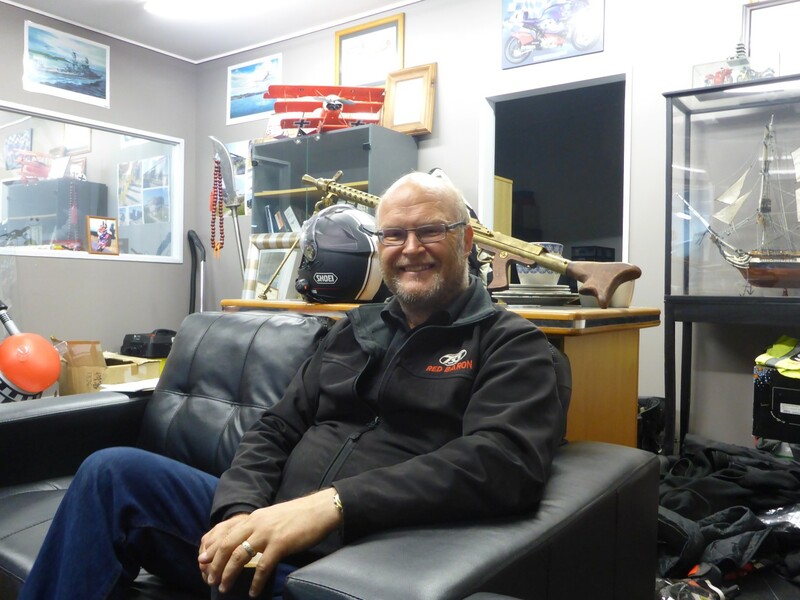 I went back to Red Baron Suzuki and had a nice chat with Stewart. He came to NZ from Glasgow at four years old, and has made a great success of his life and his business. He often goes over to Europe for biking holidays so we had plenty to talk about. 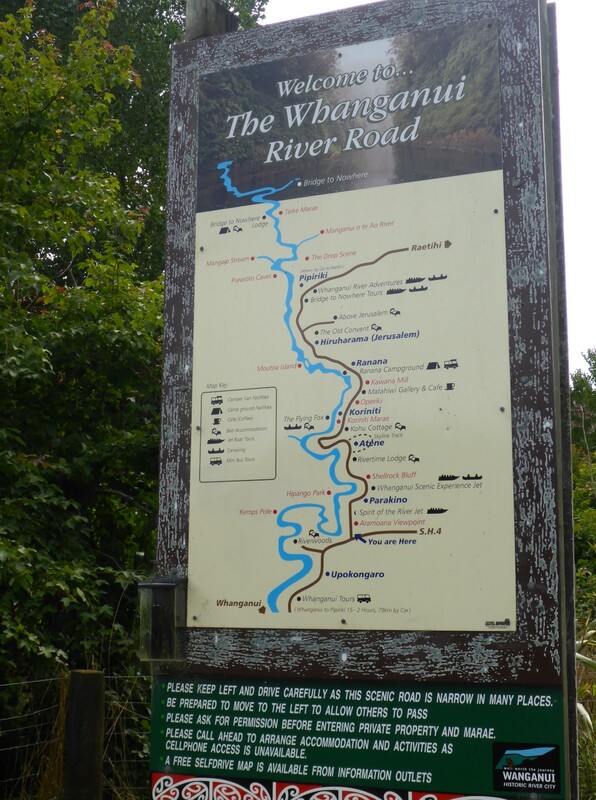 All about the Whanganui River Road. I enjoyed every single kilometre! 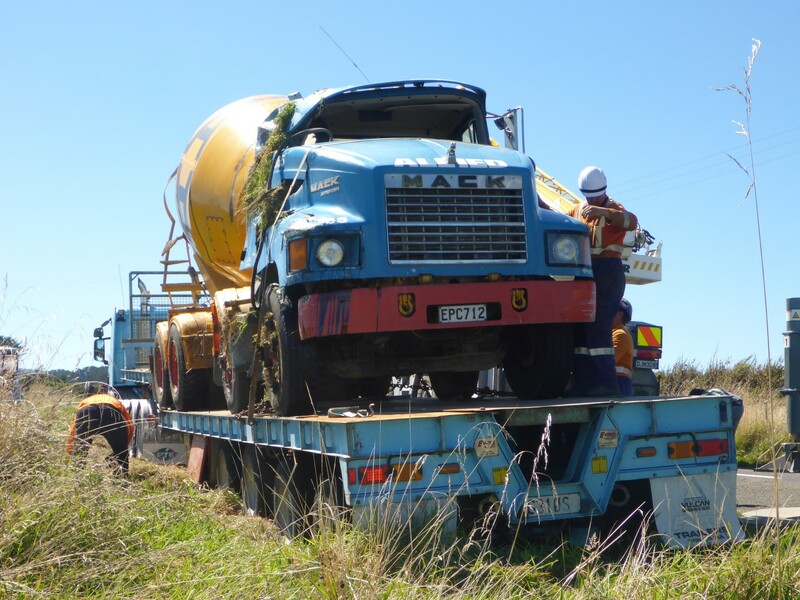 Time to move on and I now headed up the west coast to New Plymouth, via the Forgotten World Highway. Strange name for a road and, naturally, I had to go and find out why. 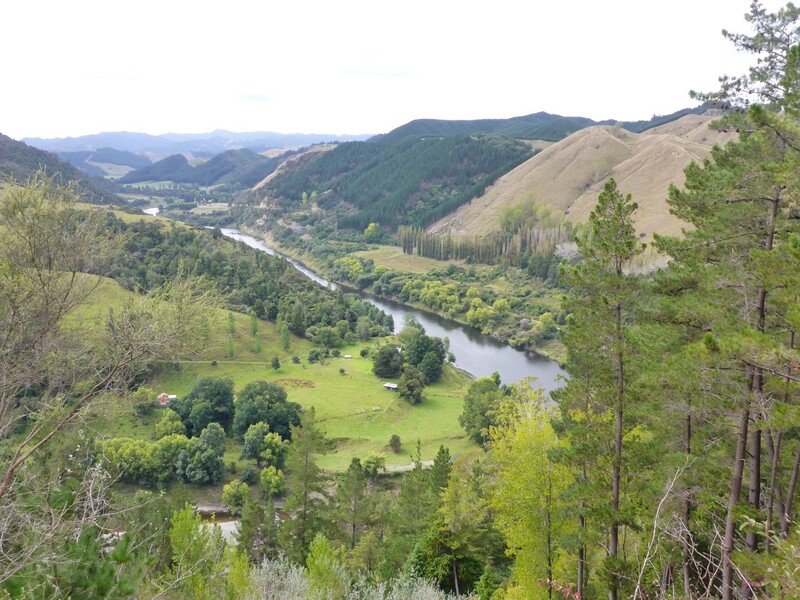 A very nice ride up the road by the Wanganui River, and an overnight stop in a hostel in Okahune, got me to Taumarunui, where the FWH begins. So does it live up to its name? Well considering the whole idea is a construct of the Department of Tourism, surprisingly it does. The countryside it crosses is quite strange, formed by seabed upheavals which resulted in very sharp hills and ridges, yet to be rounded down by erosion. 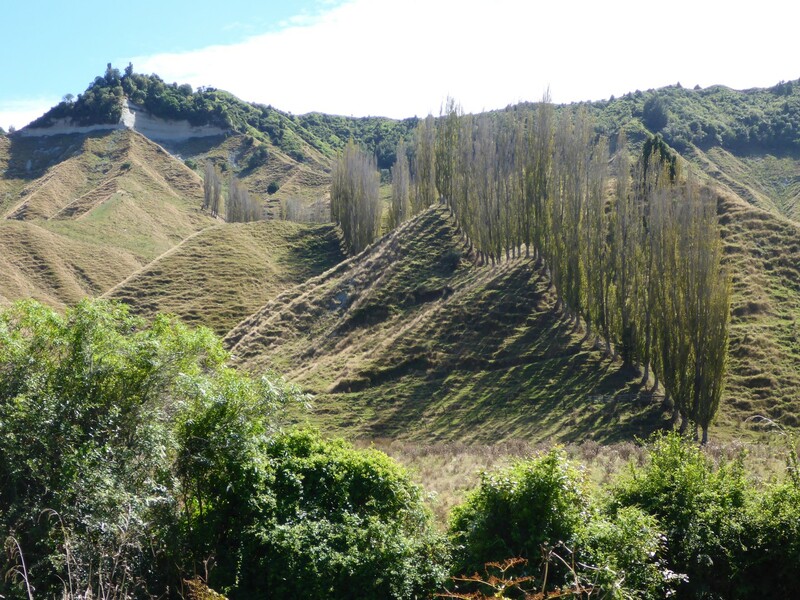 There are several sites where now abandoned activities once took place, such as coal mining, milling, logging, Maori Pa’s (fortified villages) and so on. 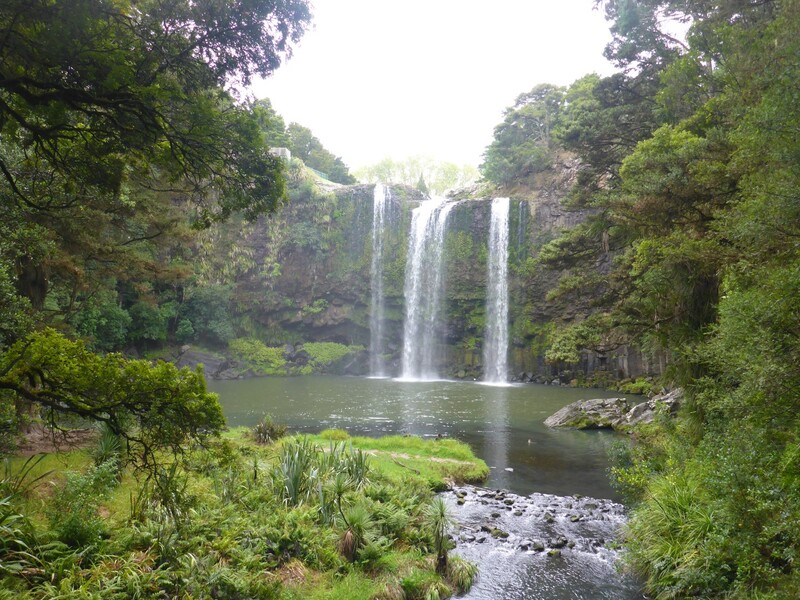 The Tangarakau Gorge is a highlight, having been originally formed by a river, which then dropped even further down and is now out of sight from the road. 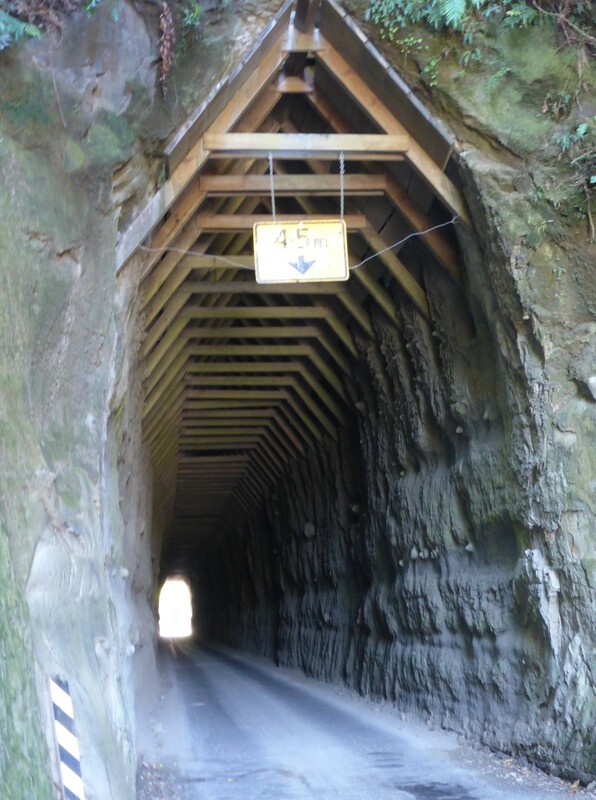 Hand dug tunnel near the Tangarakau Gorge. At this point the road was gravel and it passed through another of those hand dug tunnels, this one with rafters supporting the roof. The road was narrow and twisty and did indeed have an air of being lost. 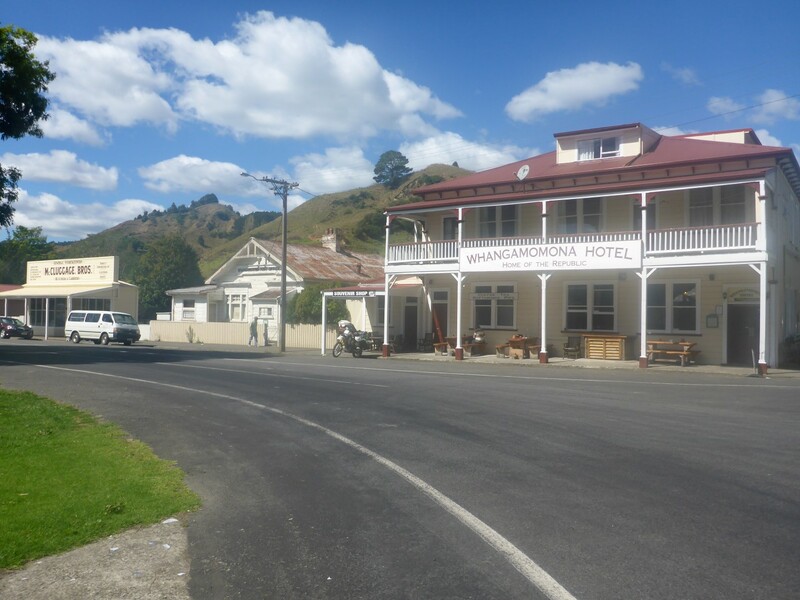 Towards the other end of the road I came to the village of Whangamomona, a small place with about ten wooden buildings along its main street. Bronwyn had told me about it. Following a dispute with local councils, the village declared itself to be an Independent Republic. Although the dispute has long since been settled it celebrates its status with a festival in January every second year. Cultural centre of the village. I had stopped at the hotel for some lunch and got chatting to a local biker. Brian told me the festival and military style parade attracts 10,000 visitors, although looking at the size of the place I can’t begin to imagine how they all fit in. Bronwyn had told me it was a tradition to pick on one of the tourists and chuck him in the slammer for a couple of hours, just to prove they still could. 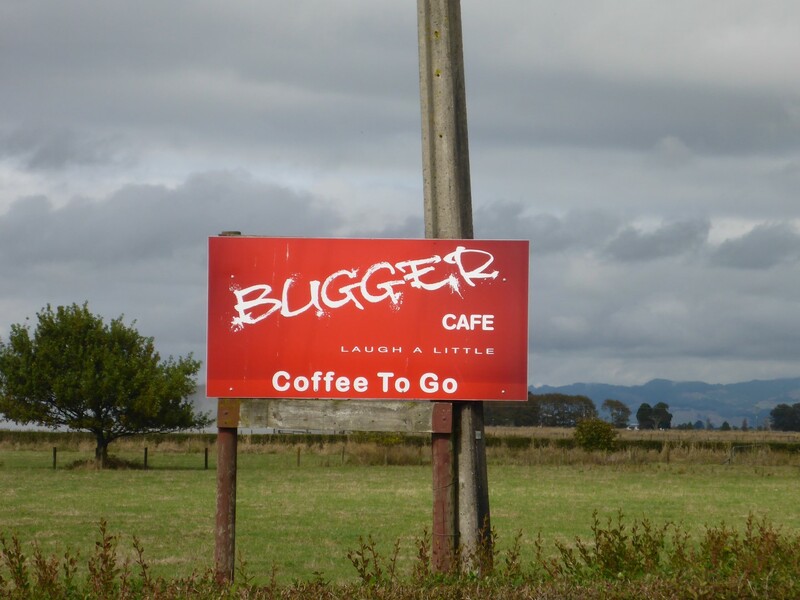 A fantastic bit of Kiwi eccentricity and hokum. By now I’d reached the conclusion that it’s the quirkiness of NZ that I love so much, plus the very friendly people, who’ve always got time to pass the time of day. Their way of going about things is usually a bit left field and they seem to feed their sense of humour into everything. It’s just great! 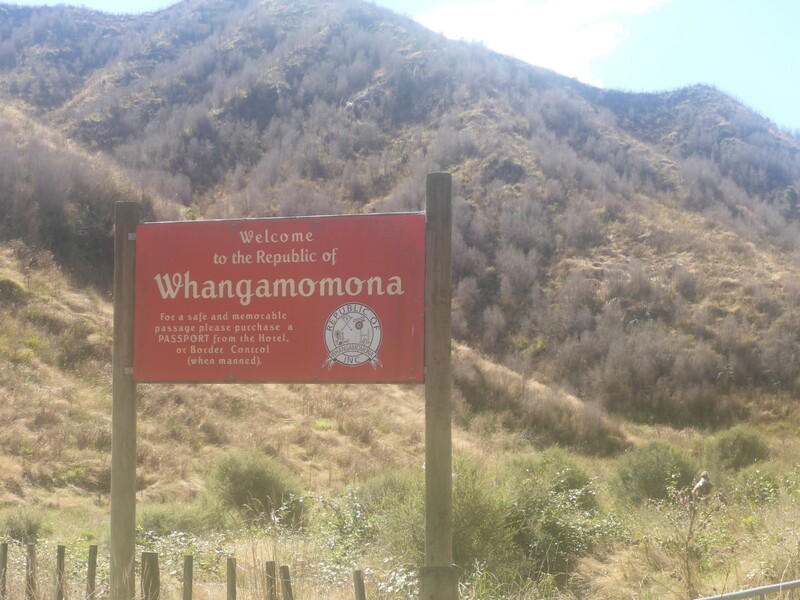 Entering the republic of Whangamomona. I spent a couple of days in New Plymouth, enjoying a walk along the sea front path and around the town. A museum, in a former settlers house, told about the Taranaki war that had taken place between Maori and Europeans in the 1860’s, mostly over land. It revealed some pretty typical Victorian attitudes among the settlers towards natives too, although it’s clear that NZ wasn’t as bad as many of the places that Britain colonised. I also took a ride around Mount Taranaki, one of the three local volcanoes which shaped the area. It could shape it again at any moment – it’s not extinct! Mount Taranaki. Ready to blow? The rain stopped soon after I left New Plymouth, as I hoped it would, and I had a good ride across the hinterland, enjoying some tricky gravel trails on the way. I passed through small villages, some of which looked more like ghost towns than the thriving places I’d been used to. Signs of the times I suppose. Another tourist destination loomed, Waitomo Caves, which I visited after a night in a nearby hostel. A hostel where I complained bitterly to the staff because I had to pay for wi-fi, which started out painfully slow then failed altogether. I was less than impressed! 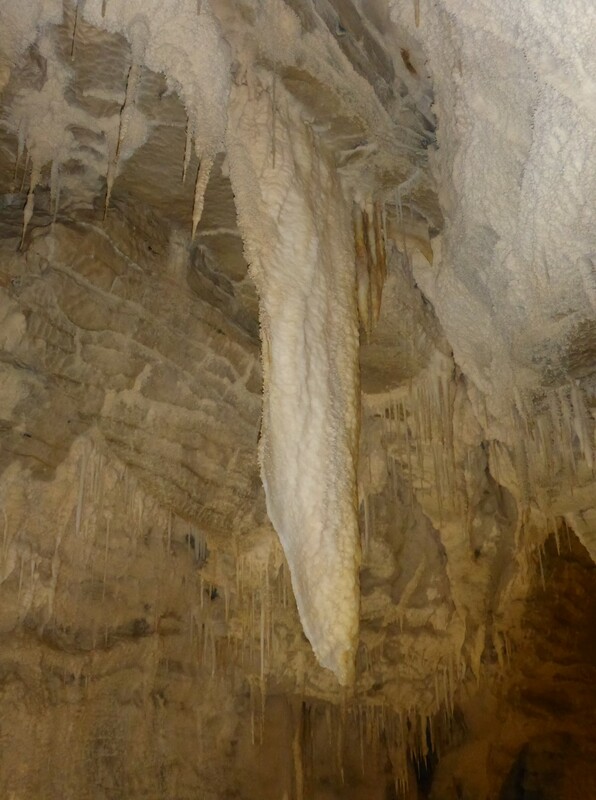 Curtain type stalactite. About 100,000 years worth of drips. 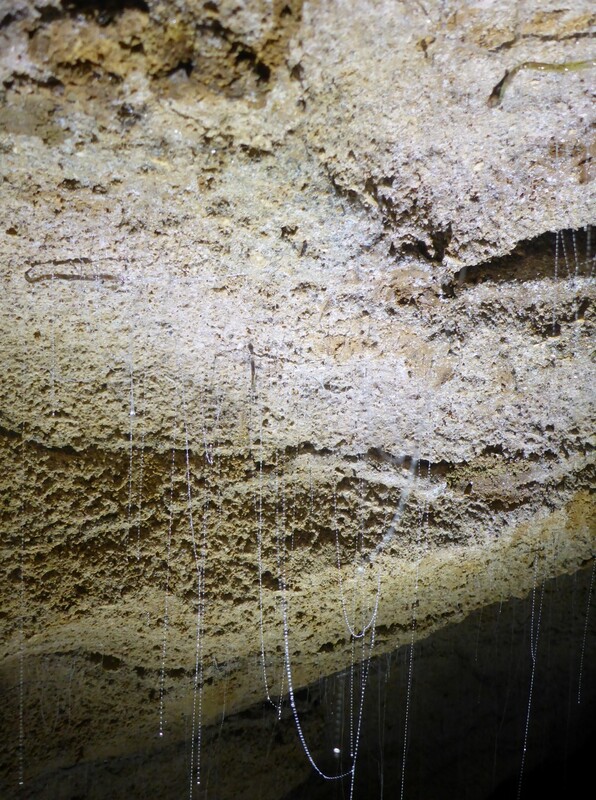 Waitomo Caves is famous for stalactites and glow worms. I’d seen plenty of stalactites/mites before although these were rather good, as was our young Swedish guide. She told us that over the years some land rights had been returned to the Maori tribes and the original entrance to these caves used to be within one of those areas. The new land owners declared the land to be sacred so the entrance was moved and the opportunity taken to create a fantastic circular ramp, with full wheelchair access, going down about fifty metres to the caves. All the paths are wheelchair accessible and they took us past plenty of fascinating limestone rock formations, as well as curtain type stalactites. Something I’d not seen before. Our guide told us that the water dripping off the end of them started its journey at the surface 18 months ago. Most interesting of all were the glow worms. They’re really maggots and the glow comes from sticky ‘fishing lines’ that they drop down to attract bugs. Once one has been caught the line is reeled in and the maggot drills into the bug’s head and extracts its brain, discarding the rest. They really are charming creatures. When they hatch they will eat their nearby unhatched siblings too. As adult moths they have no mouth or digestive system so all they do is procreate and then die. But they do look really good glowing in the dark! 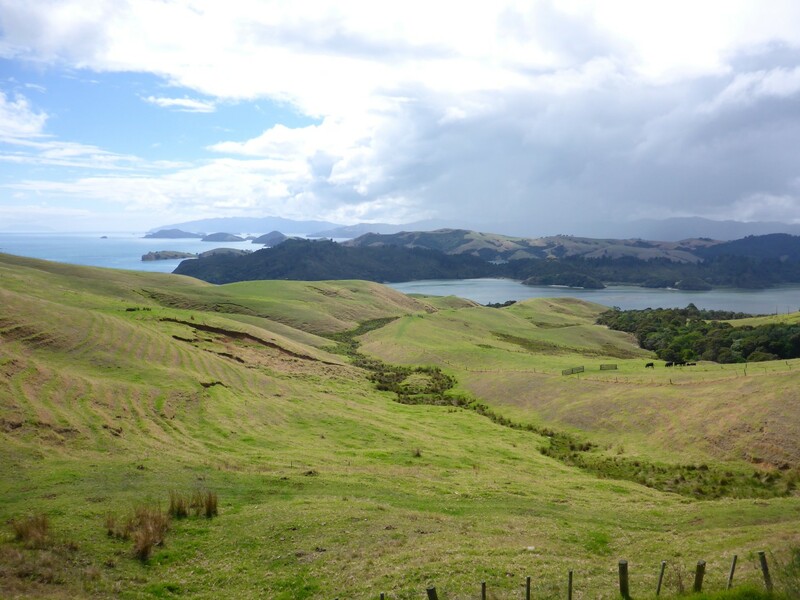 After the lurid caves I headed eastwards across to the Coromandel Peninsular. 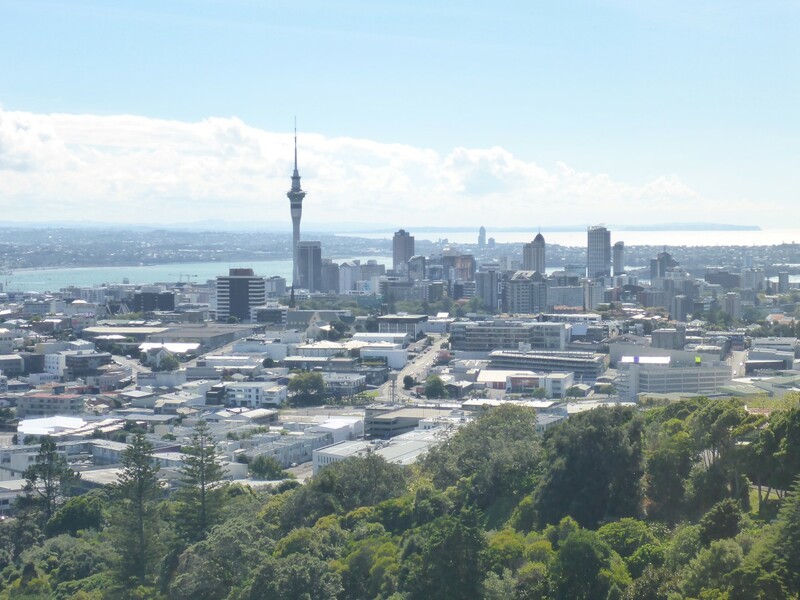 This area is Auckland’s playground and many of its towns are popular for weekend breaks, and at holiday times. The town itself is up towards the north of the peninsular and made a good base from which to ride around the pretty coastline and explore more gravel trails. Alice the Garbologist, with his 1942 WA Flathead. Coming out of a shop in town I saw, parked across the road, a Harley Davidson sidecar outfit. 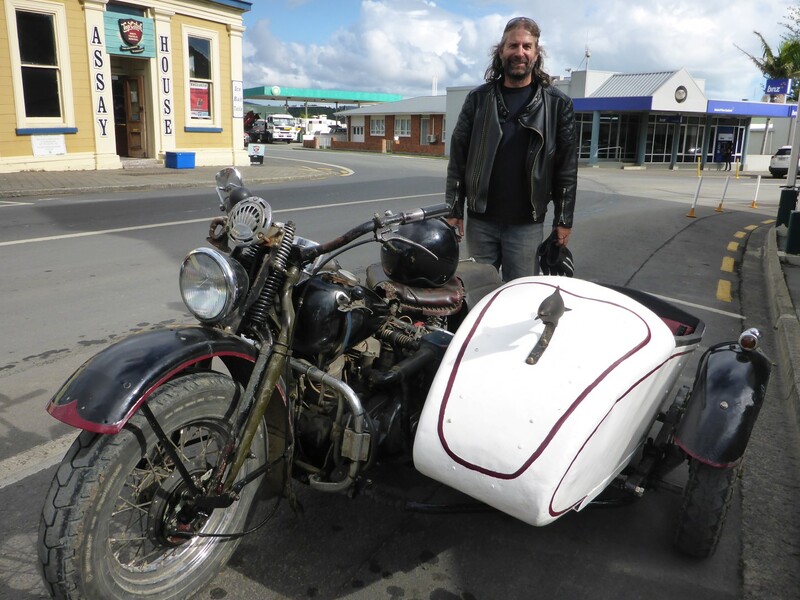 It was clearly very old and when I got chatting to the owner I discovered in was an ex-military 1942 WA Flathead. He was just as interesting. His name is Alice and, according to the card he gave me, he’s a Garbologist. He runs a company which gives advice on how to turn Rubbish into Resources. He said he has a house further up the coast, where he lives off-grid, and he invited me to visit. He’s ridden the Harley outfit round Australia a couple of times and he struck me as a very interesting guy. When I rode out to visit him I couldn’t find his house, despite the directions he gave me, and he wasn’t answering his phone either. Such a shame as, more than anything else, I wanted to find out how he got his name. 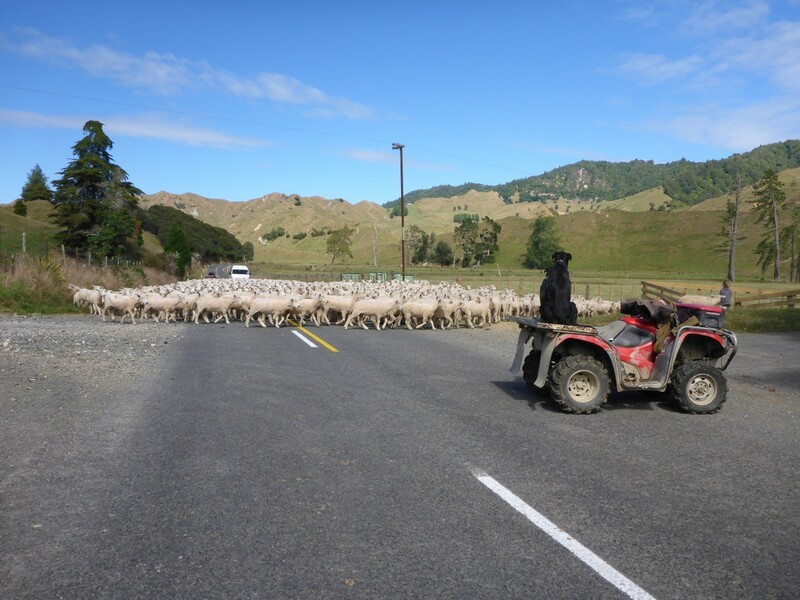 But at least I had a nice ride around Coromandel Peninsular’s gentle and pretty coastline and it was easy to understand its attractions to Kiwi holiday makers. I had time to kill so I stayed at the hostel a couple of days more, catching up with some writing and getting closer to resolving all the issues surrounding the shipping of my bike. AANZ and RAC UK were getting their respective acts together so progress was good with regard to the Carnet. Go Logistics were proving to be helpful and well organised with regard to the shipping. The only issue still to be resolved was the crating up of the bike, and that was down to me to organise. I wasn’t at all happy with the quotes I was getting so I was going to sort it out when I got to Auckland. 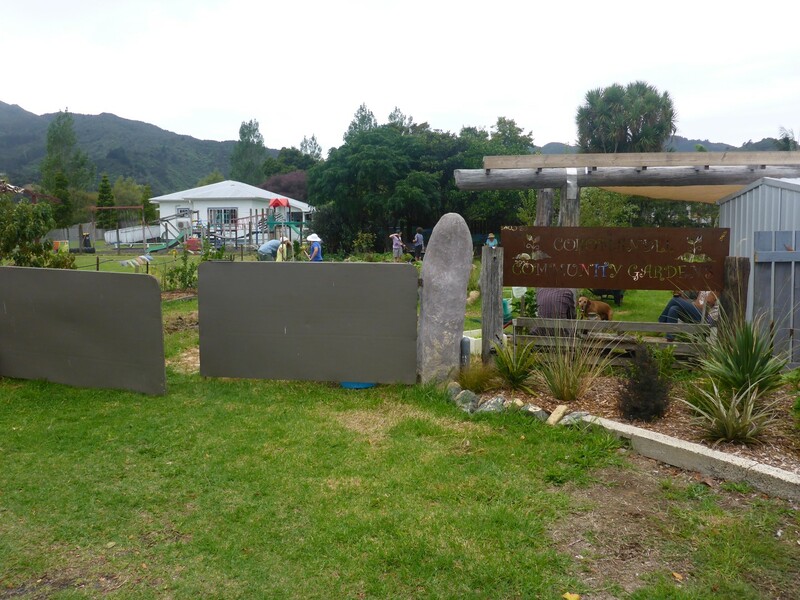 During one of my walks around Coromandel Town I saw a community area which had a meeting hall and a community vegetable garden. I was delighted to see adults and children working together in there, who were happy to pause while I took a photo of them. It’s great to see such things. I was due to arrive in Auckland on Monday so I decided to head north of the city for my last weekend of touring, up to Whangerai. It lies on the east side of the northern peninsular and is also a popular holiday area. On the way up I called in to the AANZ office in Auckland to meet my contact there, Alastair. He needed my Carnet so he could complete the work required to extend it. He was confident it would all be done in time. Once I’d arrived at Whangerai I got to the hostel I’d booked and then found they had no wi-fi. It was a bit of a ‘Mom and Pop’ operation but even so, I expected better. The owner was happy to ring up another hostel for me, which had vacancies, so I went there instead. It was a nice place, a combined camp site and hostel. While I was there the owner let me use his hose, enabling me to give Doris a good scrub down ahead of being crated up. Like all my camping gear, she needed to be as clean as possible. Nearby is a path which follows the Hatca River down past the Whangerai Falls and on into the town. These are very nice triple waterfalls and have good viewing points top and bottom. There are several other well laid out tracks that lead to various woodland vistas, including some more giant Kauri trees . The town centre itself is nothing too special although the harbour area is very nice. Plenty of nice boats and the funky looking Canopy Bridge, which sits at the end of the harbour basin. It houses a market every Saturday morning, full of artisan products. But for me the best place in town was Claphams national Clock Museum. One eye points to the minutes, the other to the hours. It’s named after Archibald Clapham, a local farmer, whose hobby was collecting and repairing clocks. He enjoyed showing them to visitors. 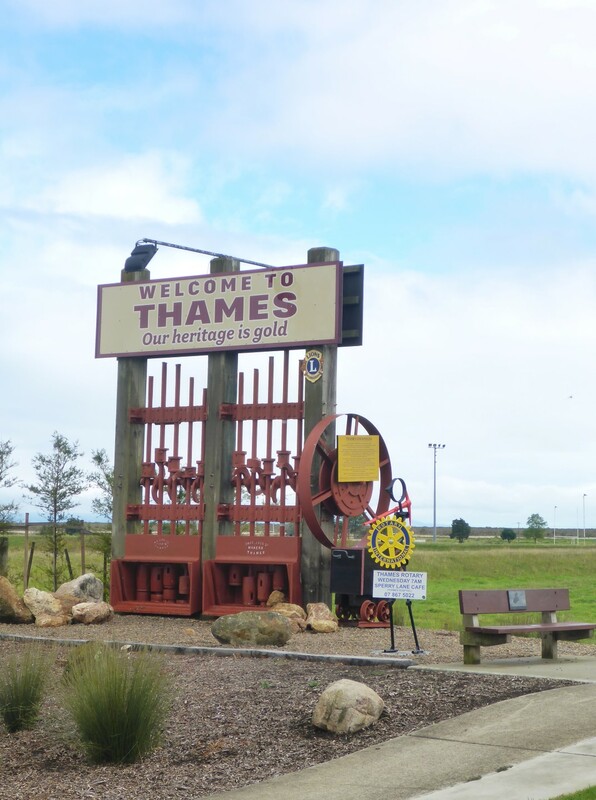 The 400 strong collection was bought by the town council in 1962 and has since grown to include 1400 clocks and timepieces from around the world. 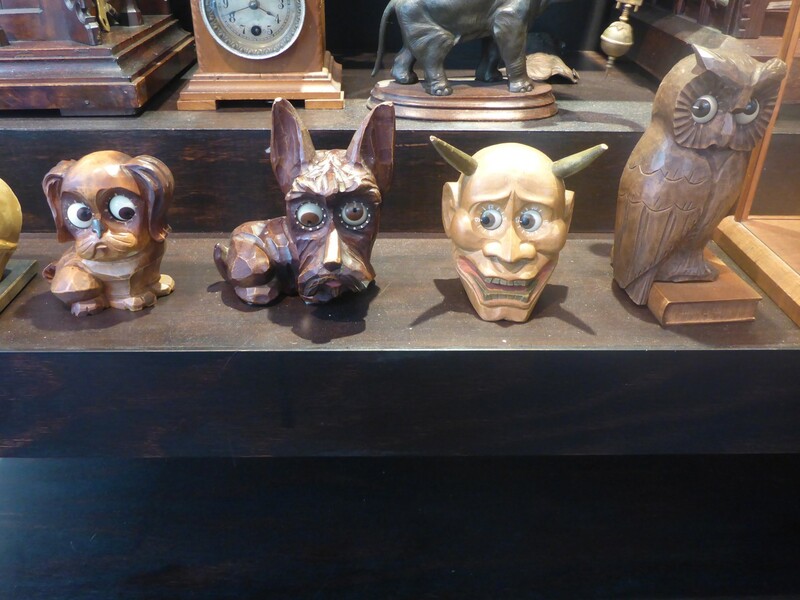 Household clocks, factory and station clocks, cuckoo clocks, novelty clocks. Often rare, all of them fascinating. The helpful woman working there was happy to show me around and tell me the story behind the collection, and about some of the more distinctive items in it. Absolutely fascinating and well worth the time spent. It has never ceased to amaze me how many well stocked and run museums there are in relatively small Kiwi towns. I don’t quite know how they do it. 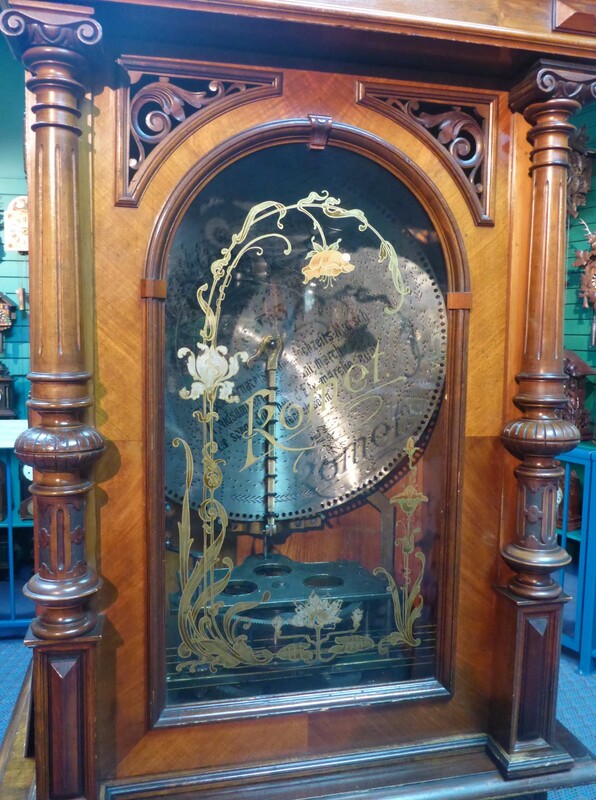 A very special German music machine. Monday, and time to head back down to Auckland. Things to organise and business to be done. I’d booked a hostel in the CBD and on the way there I called in to a couple of bike shops to see what the situation would be with regard to obtaining a transportation frame and cover. The first one was happy to give me a frame but I would have had to collect it and then take it to the shipping company’s warehouse. The second place I went to was a Harley Davidson dealership and I was surprised to discover that they could not only provide two different sizes of frame, but also the heavy duty cardboard cover that went with it. In fact, they offered a service whereby they would supply the fame and cover, and also load my bike onto it for me, with no need to take anything off the bike, all for $225. The cheapest quote from a packing company was $585 and I would have to strip the bike down, in the same way that I did in Korea. Food for thought. The only drawback was that using the Harley frame would significantly increase the crate size and thereby increase the freight costs. The solution was to ask the shipping company to provide a second quote for the bigger package and do some calculations. 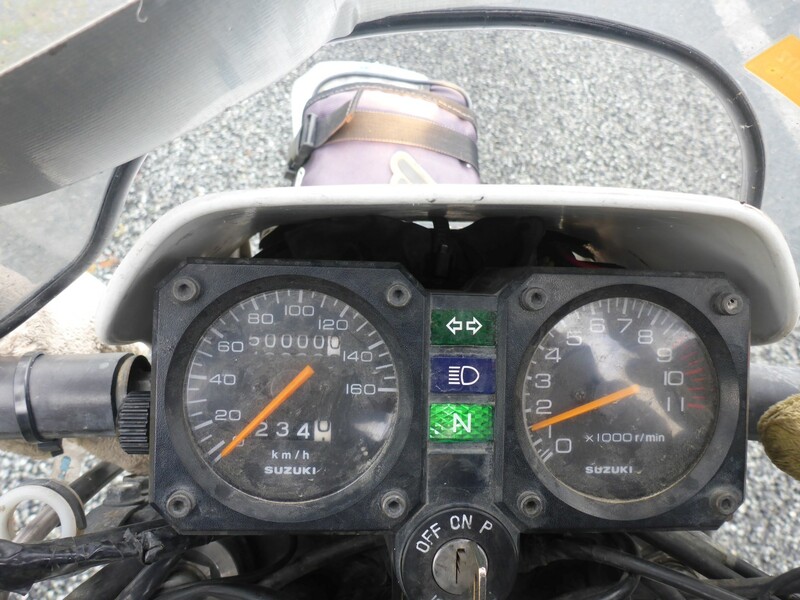 This clock was significant – kilometres travelled since leaving home. Slowly, slowly,as the week went by, the series of administrative tasks around carnet and shipping coalesced and linked together into a chain that lead to a successful result. On Tuesday I went to see Alastair at AANZ and got my Carnet, now extended for twelve months. It took until Thursday to get the second shipping quote, as my contact at Go Logistics was away. As I thought, the shipping costs had gone up and there was a fee for collecting the bike from the Harley dealer’s, but when I worked it all out it would be $5 more. No contest really, especially as I wouldn’t have to strip the bike down at all. So I went straight down to the shipping company to give them my carnet and complete the paperwork – there was very little of that – then I headed to the Harley dealers where I made all the necessary arrangements and paid them. I had to leave the bike with them as they couldn’t do anything until Tuesday. So I disconnected the battery, removed my panniers so they could be packed around the bike, and caught a bus back to the city centre. And that, as they say, was that! All done just in time as the next day was Good Friday. I would see Doris again in Brisbane So now I had the Easter weekend to kill before I was due to fly back to England on the Tuesday. 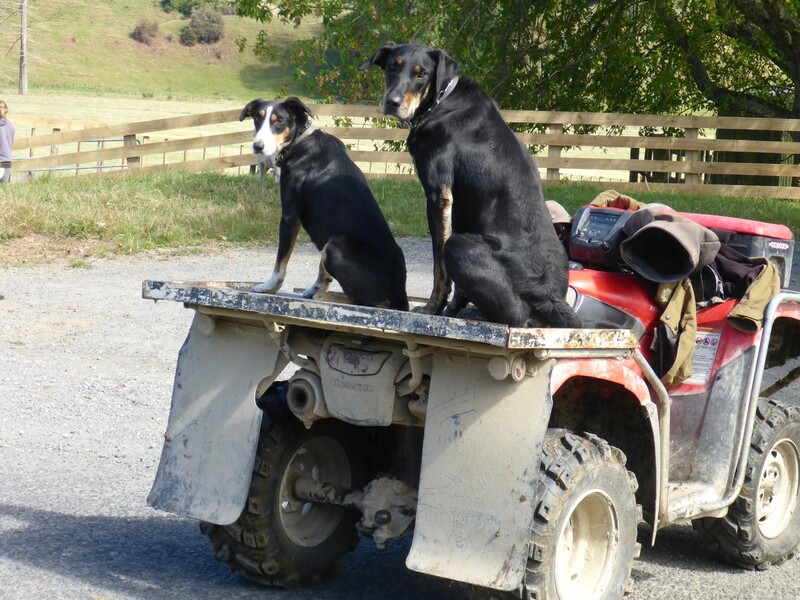 A common sight in NZ. It stands for Gasoline Alley Services. What do you do over a four day weekend, in a strange city, with no personal transport and where you know almost no-one? Not much, is the answer. I had already been to see Sue and Thommo, my hosts from when I arrived. In the meantime I had plenty of writing to catch up on; I needed to plan visits to friends and family; and I needed to organise a few things that had to be sorted out while I was back in the UK. So over the first three days I did all of those things, and on the fourth I went forth for some much needed exercise. I’d sat on my fat backside for three days and I needed to stretch my legs. 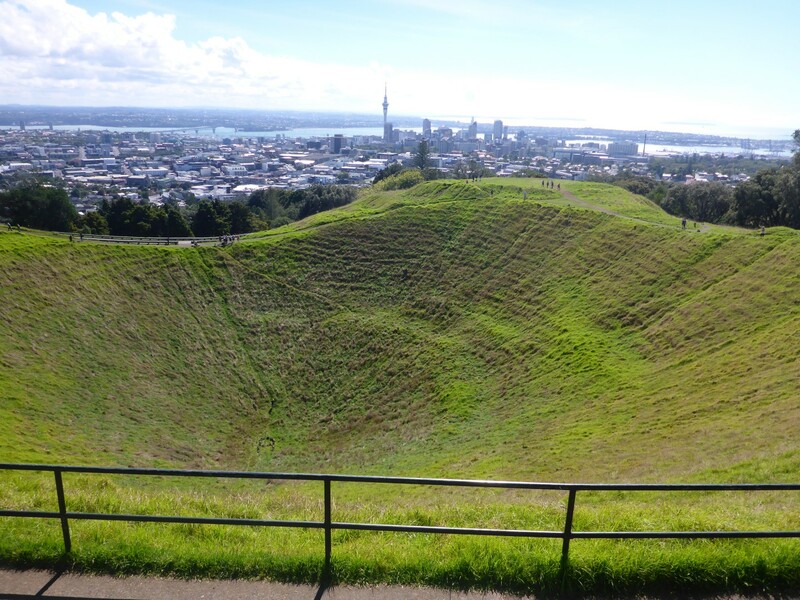 My destination was Mount Eden, one of the former volcanic peaks that surround the city. It was an interesting walk there because I was able to compare different aspects of the city. Towns and cities never stay the same and Auckland has enjoyed huge expansion recently. Most of the growth has been in the suburbs but the city centre has been altered by new buildings, roads and other infrastructure. I believe that we humans are suited to, and enjoy, urban life. It meets our need to operate collectively and our desire to support one another. Although we often dream about the remote places of the world few of us actually want to live there. So towns and cities suit us best. The imagination and vigour of planners and engineers finds its best outlet when creating these places. They’re never perfect but we adapt to them and often adapt them to us. So the juxtaposition of century old buildings and the more recent skyscrapers works for me. I’m just as impressed by a well designed modern road bridge as I am by a homely and friendly row of wood built shops. But town planners, as well as being good at creating places for work, are often equally good at taking advantage of natural features to create spaces for leisure. The Mount Eden Domain is no exception. The steep walk up to the 200 metre summit is along a circular road, with steeper paths going more directly up for the fitter and more adventurous. There are areas showing the natural plant life of the region too. In very civilised fashion there is a car park at the top, just right for coaches delivering the list ticking foreign visitor. But all of that was forgotten when I got to the top and saw the fifty metre deep volcanic crater, carefully protected from the tourist hordes. It gives a sense of timelessness. A false one though. 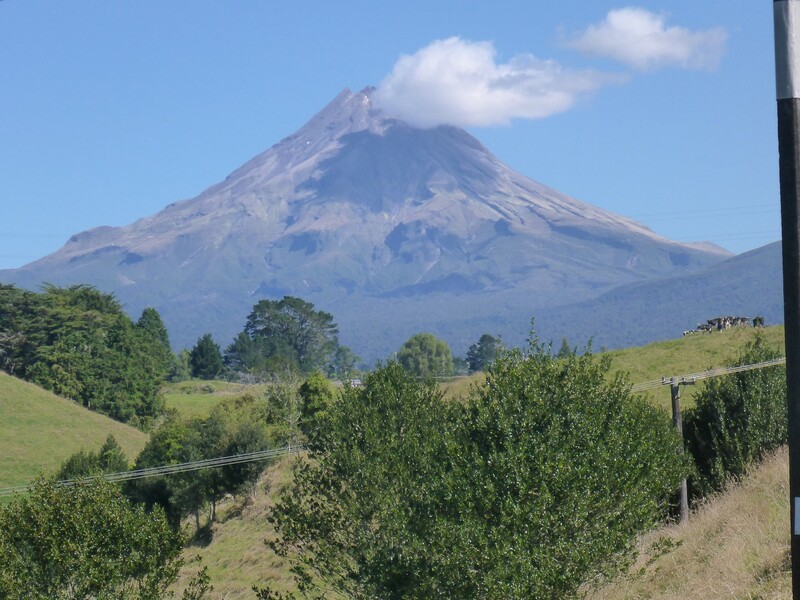 There are forty nine volcanoes in the Auckland Volcanic Field and the most recent eruption was around six hundred years ago, based on Maori oral legend. It is extremely likely there will be more in the future but it’s impossible to predict when or from where. In my lifetime? In my grandchildren’s? Nobody knows. Former volcano. When will the next one erupt? None of this troubled me as I enjoyed the views out over the city and across to the harbours on each side. 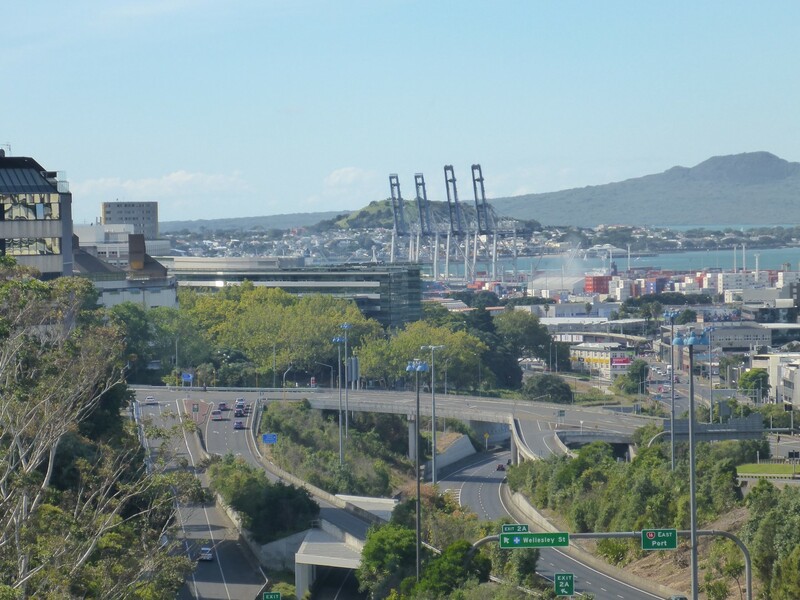 The isthmus on which Auckland sits is only nine kilometres wide so it’s easy to see the sea and the harbours. 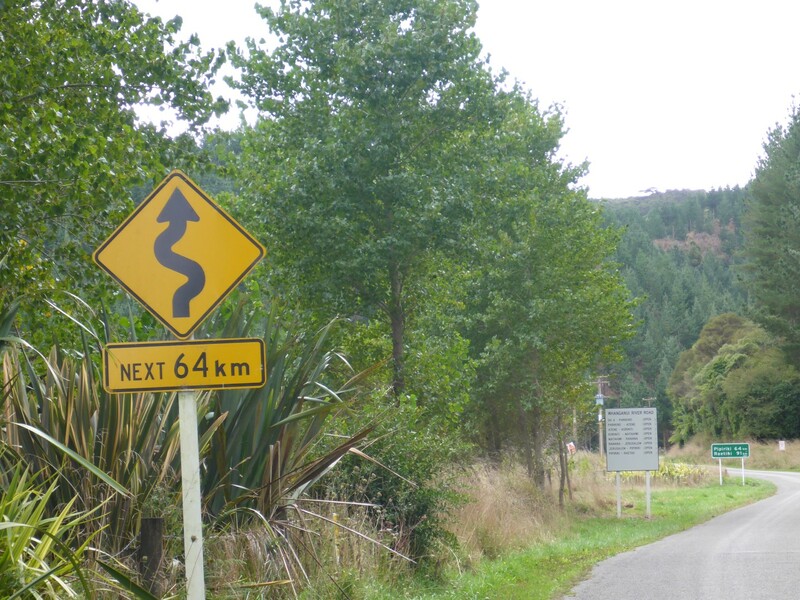 There is a cycle and walking track that crosses the city, itself part of the 3,000kms long Cape Reinga to Bluff walk. The smartly dressed Chinese tourists that thronged the hill top seemed to love bright colours, very apt for such a sunny day. Big Bird has come to play. The sparrows don’t seem to care. A ‘Domain’ is the name given to the area in Kiwi towns and cities where public events take place. They are public spaces, and I was told that camping is often permitted there. On my walk back I passed by the Auckland Domain. 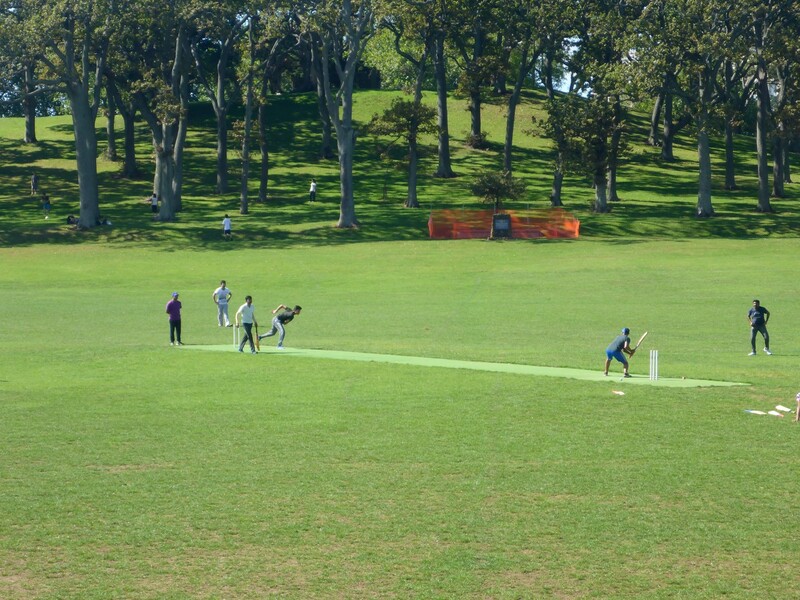 I stopped for a snack and spent the time watching some guys enjoying a friendly game of cricket on the public pitch. The sport has enjoyed a surge in popularity since NZ’s national team, The Black Caps, reached the World Cup Final, which they lost against Australia. The Domain was used as a mustering point for WW1 troops, from where they were sent off and then welcomed back, by the people of the city. Likewise for WW2. 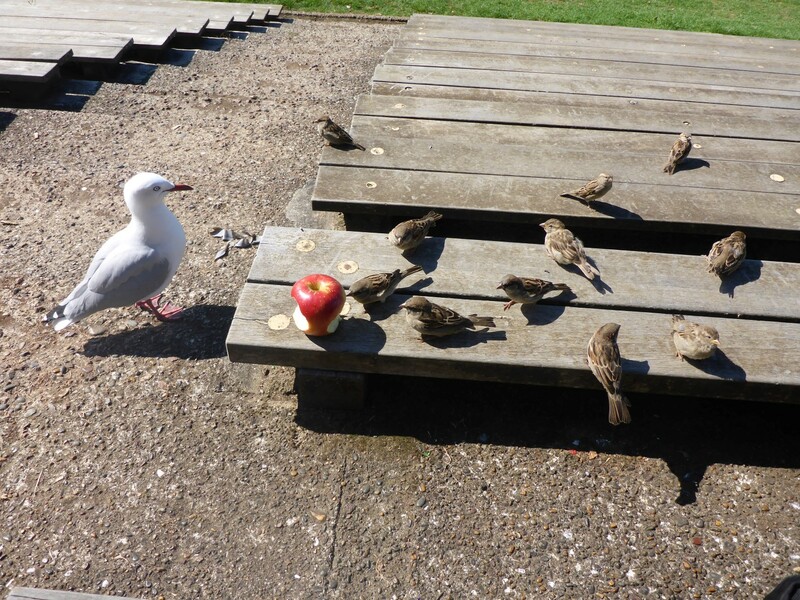 Something to contemplate while I watched the cricket and shared my apple with the birds. The city museum is there too although I didn’t bother to visit. Back at the hostel I finished my preparations for the journey back to England. I wouldn’t be too sorry to be leaving there. City centre hostels tend to be big, soulless places, although I’d enjoyed some good conversations with a few people. But it was a noisy place too, and most nights had been disturbed by people talking outside and doors slamming inside. 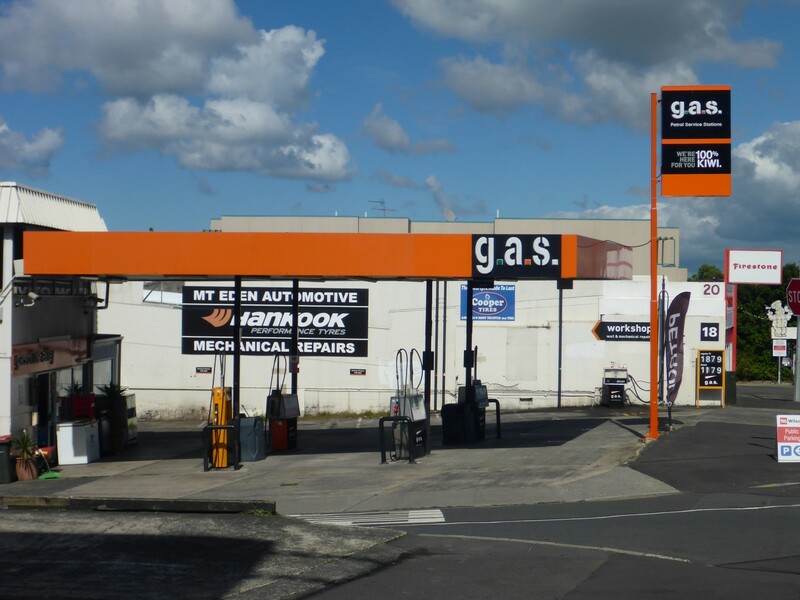 One excellent service which Auckland has is an express bus service from the city centre to the airport. It runs every ten minutes, the journey takes about forty five, and the bus stop is less than 200 metres away from the hostel. Just as well really as my bag was pretty weighty on my shoulder. I left at 10am and was at the airport, checked in and through security soon after 11am. Both flights were nearly empty so I had room to relax and stretch out a bit. Even so, it wasn’t a comfortable time and I was very glad when I reached London.After a cross town public transport journey I finally made it home. It was time to relax and enjoy seeing family and friends while my bike made its way from Auckland to Brisbane, ready for my arrival a month later. Modern roads to support the city’s industry. So what of New Zealand? What a fantastic place to spend time! Any Brit would feel right at home there and I got the impression that most Europeans did too. So much of the culture is familiar, not surprisingly. But the big difference lies in the space there is in the country as a whole. That’s especially the case in the south island with its huge areas of national park. Any outdoor pursuit you care to mention is available, along with adventure activities, and I was delighted to have enjoyed the varied natural beauty. 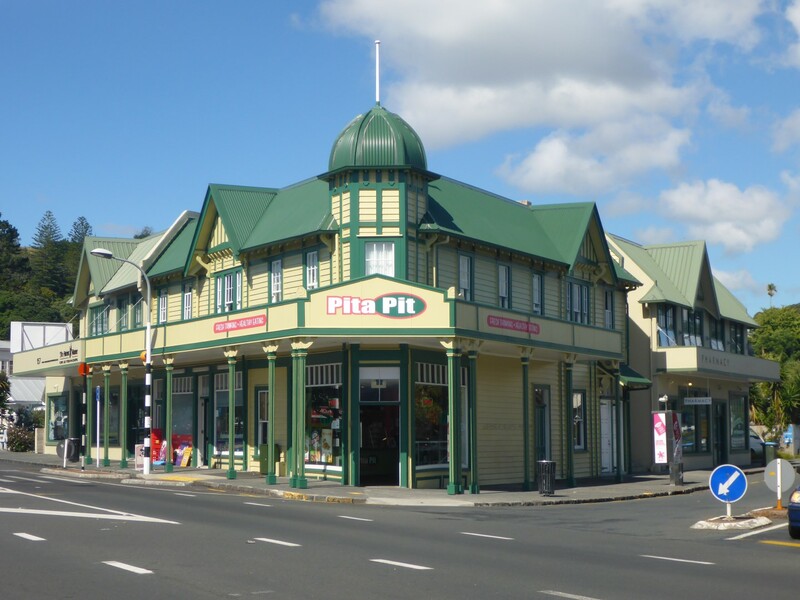 As a counterpoint, the big towns and cities were equally fascinating and what they lack in centuries of European style history, they make up for in delightful public spaces, usually laced with that nice touch of Kiwi quirkiness and humour. It’s a fantastic place for riding a motorbike too, with possibly the world’s most positive attitude to bikers and well srfaced roads with lots of bends. And more bends. And yet more bends. Heaven! The people are fantastically friendly and helpful. They take pleasure in passing the time of day with visitors and I never felt like I was a nuisance, as can sometimes happen. It had been a real pleasure to visit old friends from England, meet relatives previously unknown to me and stay with new Kiwi friends. 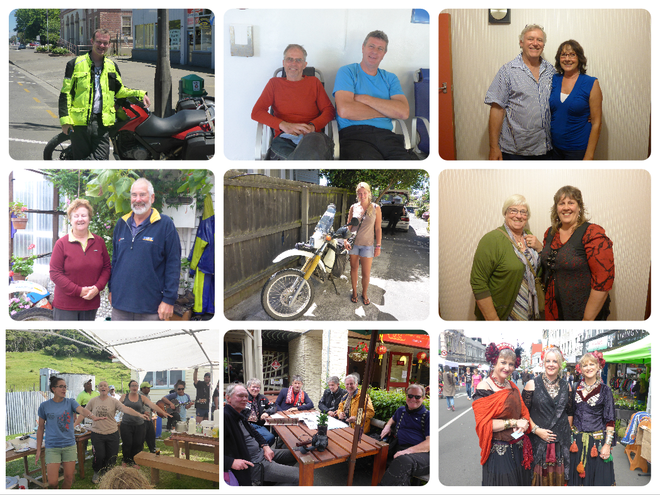 I had a great week with Maureen in Dunedin, which led to meeting several of her friends. 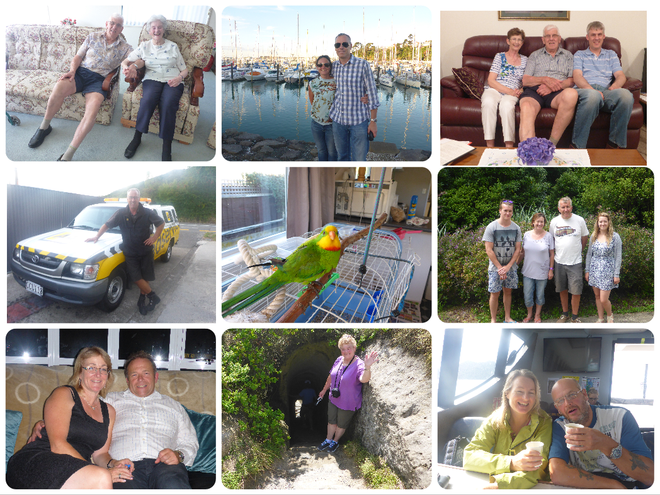 The time spent with Sue and Thommo; Jeff and Cate; Chris, Ryan and Lisa; Guy, Bronwyn, Steve and Reg (the parrot), had been wonderful too. I had completed my circular tour of both islands. I’d ridden roundabout pretty much everywhere and it had, indeed, been magic. 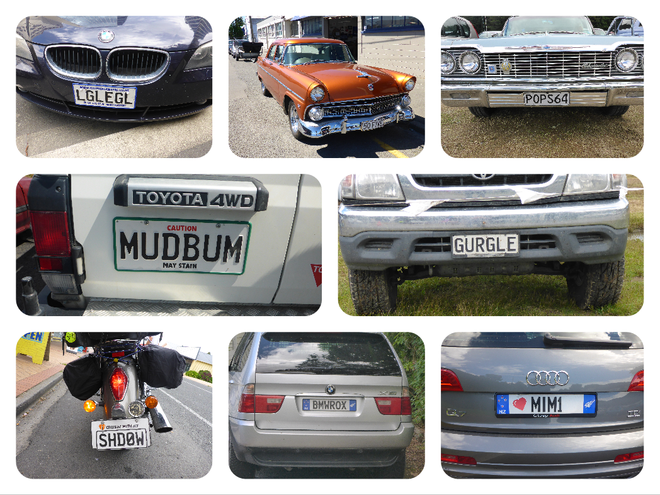 So many things were good about NZ but it’s invariably all about the people, and their humour. So I couldn’t resist a few more photos to finish off with. Some of the great people I met. Making the most of six digits.